I don't much bother with the plug-outs, so the unlit parameters don't bother me. The raw S8 model sounds close enough to a JP8 that I rarely go past it. Just thought I'd post a update from Uli for those who do frequent "the other world". Final preproduction samples have been approved and they are gearing up for mass production. Targeting $299 list price (excl. Tax). And here is a link to a picture Uli posted of the final version. Thanks for the update. Even though I have the real thing the expansion potential with those CV jacks can't be ignored, especially at that price. Not a keys player here but why does nobody build a keyboard with a slot for a module like that (Uli?)? A couple or three variations (37, 49 and 61 notes, anything less than 2½-3 octaves is a complete waste of time, plus, maybe a mini keyboard version) with a slot for different modules like the aforementioned Berry Pro-1? I would buy a MiniMoog version with full sized keys but can't bring myself to buy the current mini key version. Sam Spoons wrote: Not a keys player here but why does nobody build a keyboard with a slot for a module like that? The Behringer Model D is 70 HP wide, so would fit in that Waldorf with room to spare for a couple of extra modules. Presumably the Pro one would be the same length, and with the CV in/outs, could make use of some extra modulation or mangling modules. The Model D needs a 1A supply, so the Waldorf has 0.5A spare for other modules. I expect the Pro One would be similar. But for a lot less, you could probably DIY a MIDI keyboard in a wooden case with space for a Model D (or a Pro One - or even both! ), fixing the wall-wart PSU inside and connecting it to an IEC socket. The outputs are on a separate board with a ribbon connector, but as this also has the MIDI connections which you'd want to keep inside the case, then you'd probably need to wire out to duplicate audio outputs on the case, and maybe install a MIDI merge module inside as well so you can connect to your DAW as well as use the keyboard. Looking at the Model D manual, the downside of mounting in something like the Waldorf is that the output is now only from the 3.5mm jack on the front of the panel, which is less than ideal (unless you butcher the Waldorf or mount the I/O board on a separate panel in the spare rack space of the Waldorf. And of course the MIDI ports on the Model D are on the fascia as well, so you'd need to solder wires on to the PCB for the MIDI connection if you wanted to keep everything internal. There's also not a lot of choice for 37 full-size key MIDI keyboards that have hardware MIDI ports, not USB. In fact so far I've found none at all. Had to go up to the Alesis Q49 to find a keyboard with hardware MIDI out and full-sized keys, and also a 9v power input rather than only using USB power. But that makes it all rather large. Otherwise it's just 2 octaves, which is rather small. Wonks wrote: In fact so far I've found none at all. Had to go up to the Alesis Q49 to find a keyboard with hardware MIDI out and full-sized keys, and also a 9v power input rather than only using USB power. But that makes it all rather large. Otherwise it's just 2 octaves, which is rather small. Thomann have this: https://www.thomann.de/gb/miditech_i2co ... _black.htm the 37 key Miditech i2 control for £83. They do. If only it was more basic or had the pitch and mod wheels on the left instead of above the keyboard. Still, it could probably be worked on. Thanks. A S/H Akai MINIAK could work as well, wheels are above the keys but I believe they are all one module so could be moved, and not very deep. Minimalistic interface )only 5 knobs and 6 buttons (of which 4 knobs and 3 buttons could be ignored if not using the internal VA engine). You could even use it (iirc) as an effect processor for the mounted instrument ignoring the sound engine. The only slight issue is that it runs on 9V AC so would need it's own dedicated PSU, but that could be easily incorporated inside the unit. The new keyboards in my Pro-Ones are a revelation. THIS is the synth the Pro-One should always have been! Silky smooth and light (and quiet) key action - it just begs to be played. While we were at it my engineer also replaced the gate LED - and my custom-fitted LFO speed LED - with purple LEDs. Maybe worth a photo later. Wow - you DO sound happy Monsieur Elf!! 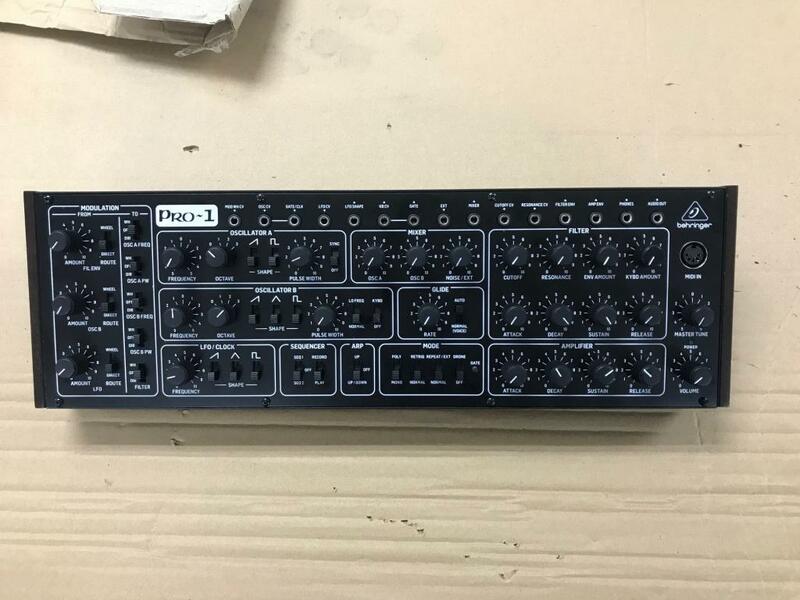 Regarding the Pro One (Behringer) people are already harping on about a Recreation of the Jupiter 8 and OBXa, but surely it would make better sense to make a Prophet 5 first instead, seeing as all the technology has been developed for it on the pro-1 ? Turning the Pro-One into a Prophet 5/10 with memories is surely an easier undertaking than embarking on a mahoosive project like a jupiter 8. Just a thought, hopefully one of the musictribe lot is onto this ? It may make sense from a technical point of view, but politically? That last picture was obviously taken before he could afford oysters so he could slap the shells against his tin bath*. *obviously 'bath' with a short 'a'. And of course it's 'bath', not 'barth' - can't you daft southerners spell?